Principal who told students, “Balik India dan Cina!” apologizes.. IT LOOKS LIKE ‘KETUANAN MELAYU’ IS VERY MUCH ALIVE IN SOME OF OUR SCHOOLS! Some teachers seem to believe that Indian and Chinese students are pendatang! SMK Engku Husain in 2009 had 1628 boys and 1678 girls, making a total enrollment of 3306 people. It has a total of 173 teachers. The assistant principal of SMK Engku Husain has reportedly apologised for telling his students to “go back to China and India”. Quoting an anonymous staff member, Sin Chew Daily said the apology was tendered during a meeting with the parent-teacher association yesterday afternoon. The staff member was quoted as saying that the issue was now considered resolved. Sin Chew Daily further claimed that representatives from the district education department had also visited the school yesterday. Prior to the run-up to the casting of votes for the 13th GE, a beleaguered Najib Tun Razak asked for, and received, “nambikei” or trust from the Indian community in the country on the specious grounds that they will receive attention for all the ills affecting them. In exchange for trusting Najib, the Indians were hoodwinked into thinking that they will be taken care of, if not as well as the bumiputras, at least they will get something for their votes. What has transpired since they cast their votes in favor of Barisan Nasional (BN) is that they have received absolutely nothing. Instead, affirmative action has been provided on a grand scale to thank the Malays for their continued support of BN in a clear reversal and betrayal of the “Satu Malaysia” concept which was used to mislead and misguide the gullible and naïve Indian community. While the Chinese community was sharp and wise in seeing through Najib’s ploys, the Indian community is now bearing the brunt of not favoring the opposition coalition of Pakatan Rakyat (PR). The Indian community now is in limbo and looks set to face a very bleak future in this country. Should Indians just take the cue from the BN government and its leaders and just “balik India” or go back home to India, the land of their fore-fathers, what a bitter pill to swallow? What a sad and tragic tale to be unwanted though they arrived here mostly as indentured labor to toil and build the Malaysian economy especially in the rubber estates? After so many years of being in this country and several generations of Malaysian Indians, the community is still shunned and not seen as partners in nation-building and have received the run-around as far as assistance in the different sectors of their life are concerned. The sad truth about Indians is that they seem to have a blind allegiance for BN. But this is a sheer case of unrequited love as BN hardly cares for the Indian community as evidenced by the way and manner the Indians are faring in this country. YOURSAY ‘How is it that during my school days in the 50s and 60s, no principals ever told me to ‘balik Cina’ or ‘balik India’? Geronimo: Losing patience with the students is no excuse. How is it that during my school days in the 50s and 60s, no assistant principals or any educators in the school ever told me to ‘balik Cina’ or ‘balik India’? Why is it that such a thing is happening so rampantly now. Over to you, Prime Minister Najib Abdul Razak. Doc: Give a few days and I am confident that Deputy Education Minister P Kamalanathan will go down to SMK Engku Husain and make a statement that no racism was involved when the assistant principal of that school told the students to leave if they do not like Malaysia. In fact, non-Malays have being doing so, taking along their talent and money to other countries and excelling there. But what is hard to understand is that these same Umno fellows will later ask the non-Malays to come back to Malaysia under the ludicrous scheme called Talent Corporation Malaysia Bhd (Talent Corp). JustAMalaysian: I can understand it if a year one primary school pupil does not know the Negaraku. For a secondary school pupil not to know how to sing the Negaraku, that is a different matter. In this case, it is the school’s responsibility to teach it to the pupil. Something must have gone wrong somewhere. And for a secondary pupil not to respect the Negaraku when it is being played or sung, the pupil must be an idiot. Whatever it is, it is not right for anybody to tell another person to “balik (return to) Cina, India or Indonesia” for whatever wrong the person may have done. Deputy Education Minister P Kamalanathan said the ministry was waiting for a report on the matter from officers handling the case. “If indeed the allegations are true then the ministry will take appropriate action,” he told The Star Online. 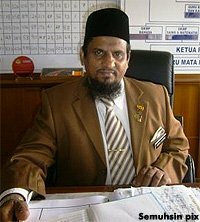 PTA president Prof Datuk Ali Hasan lambasted teachers who felt it was acceptable to tell students to return to where their ancestors came from. “In my opinion they need serious re-training to refresh their minds on acceptable teacher-student behaviour,” he said. Seorang guru sekolah menengah di Semenyih, Selangor didakwa meminta pelajar yang enggan menyanyi dan menghormati lagu kebangsaan agar “balik ke India (atau) China”. Laporan Sin Chew Daily menyebut, pembantu pengetua di SMK Engku Husain berkata demikian semasa perhimpunan mingguan di sebelah petang pada 23 September. Beliau didakwa meminta pelajar tersebut “balik” jika tidak menyukai Malaysia. Akhbar tersebut melaporkan bahawa sekolah itu telahpun menjalankan siasatan ke atas perkara berkenaan, yang timbul apabila pelajar terbabit memuatkan perkara itu di laman Facebook mereka. In what sounds like a repeat of recent incidents, a teacher in a secondary school in Semenyih, Selangor, is alleged to have told students refusing to sing and respect the national anthem to “go back to India (or) China”. According to Sin Chew Daily, the assistant principal of SMK Engku Husain said during the afternoon session weekly assembly on Sept 23 that the students could “go back” if they did not like Malaysia. The daily reported that the school was already investigating the matter, which came to the principal’s attention when ethnic Chinese students posted about it on their Facebook pages. Principal Abdul Ghafar Kunchi Mohd told Sin Chew that the students, some of whom do not understand Bahasa Malaysia well, had been advised, warned and even caned for not singing or respecting the ‘Negaraku’, but to no avail. “However, whether Malay, Chinese or Indian, everyone is Malaysian. This remark should not have been uttered. Therefore I will ask the assistant principal to apologise to students at the assembly,” he was quoted as saying. This entry was posted in Uncategorized and tagged Another teacher tells students to 'balik Cina or India', assistant principal of SMK Engku Husain, ketuanan melayu, pendatabg, secondary school in Semenyih, selangor. Bookmark the permalink.